Grab your parrot and your eye patch, put on your pirate talk matey, and dress up in your most swashbuckling gear – it’s time again for the Pirate’s Ball at Ripley’s Aquarium in Gatlinburg! It’s just a week away, next Thursday night! Ready for some tropical paradise action? That’s what Ripley’s stages for the event, when all good privateers sail into port to make merry in an evening of live music, dancing, fine food and tropical beverages. Costumes are NOT required but usually about half the attendees are dressed up. So dust off that tropical shirt and be sure to bring your camera to record the great outfits that show up – and post the pictures to our Facebook page! Let’s see the local color! Ripley’s Aquarium of the Smokies is the perfect setting to experience the wonders of the seven seas, a wondrous feast for the eyes for grown-ups and young ones alike. Kids will not be bored! Sharks, stingrays, underwater tunnels – the penguins always get people smiling, and the coral reef exhibit fits right in with the event’s bountiful Pirate theme. Ripley’s Aquarium is voted TripAdvisor’s #1 Aquarium in America, and is an experience is itself. The food is fantastic – you can be forgiven for thinking that just the appetizers alone are the fine dining. And for the Pirate’s Ball the aquarium has been tremendous with its thoughtful touches, such as in recent years placing small tables in quiet spots right in front of sea exhibits. 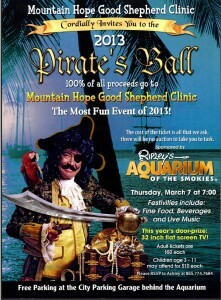 This is a FUN time, and it’s the 6th Annual Pirate’s Ball fundraiser for our great local charity, Mountain Hope Good Shepherd Clinic. Tickets are $50 and $10 for kids. Guests are also entered into a drawing for a flat screen TV – if you win maybe you can use it to replay those iPhone movies you’re going to take! So get ready. 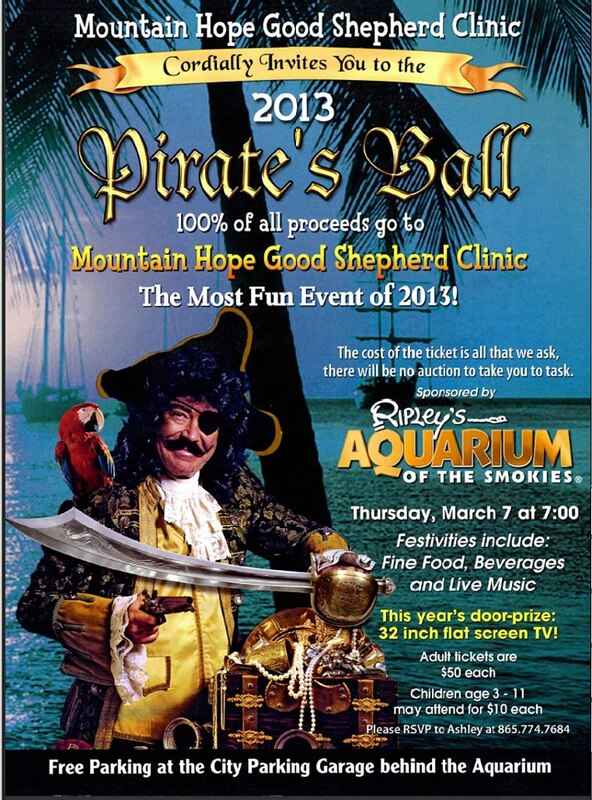 Pirate’s Ball 2013 starts at 7 pm on Thursday, March 7. Ripley’s Aquarium is at 88 River Rd, Traffic Light #5 in Gatlinburg. For more information call Mountain Hope at 865-774-7684 or check the event’s Facebook page. Have a FUN night! And remember to take pictures and videos and post them on our Facebook page. Are YOU planning to go?